Cozy mystery author Kathi Daley has a reputation among her fans as the nicest author; and it’s well-earned as well as well-deserved. As an author, she’s talented and prolific; juggling four different series, each with an original cast of characters and plots. As a person, she’s warm and approachable and cares about her fans, readers, and bloggers very much. For those of you who follow her on Facebook or receive her weekly newsletters, you know how often Kathi is sharing giveaways with her readers; today it’s my turn! 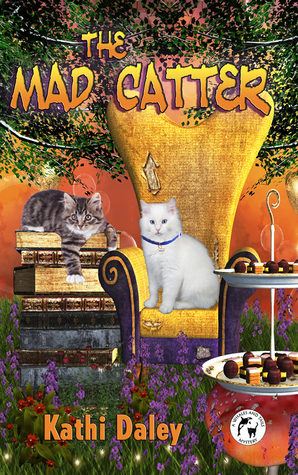 Kathi is generously offering a print or e-copy of THE MAD CATTER to one lucky winner. (U.S. winner can select either paper or e-copy. Non-U.S. winner will receive an e-copy.) You can enter the giveaway anytime between now and March 8, 2015. In other Kathi Daley news, her brand new Cutter Cove teen cozy series just released with book one, THE SECRET. And, coming in mid-March, is the third Whales & Tales mystery, GRIMM’S FURRY TAIL. You can keep up with all of Kathi’s stories and the adventures of her entire cast of characters by following her on Facebook or signing up to receive her newsletter; there’s always something fun and exciting going on in her corner of the world! I love Kathi’s books. Can’t wait to get The Mad Catter.